This article is about the comic book artist and writer. For the newspaper cartoonist, see Frank Miller (newspaper cartoonist). For others, see Frank Miller (disambiguation). Miller was born in Olney, Maryland, on January 27, 1957, and raised in Montpelier, Vermont, the fifth of seven children of a nurse mother and a carpenter/electrician father. His family was Irish Catholic. Miller grew up a comics fan; a letter he wrote to Marvel Comics was published in The Cat #3 (April 1973). His first published work was at Western Publishing's Gold Key Comics imprint, received at the recommendation of comics artist Neal Adams, to whom a fledgling Miller, after moving to New York City, had shown samples and received much critique and occasional informal lessons. Though no published credits appear, he is tentatively credited with the three-page story "Royal Feast" in the licensed TV series comic book The Twilight Zone #84 (June 1978), by an unknown writer, and is credited with the five-page "Endless Cloud", also by an unknown writer, in the following issue (July 1978). By the time of the latter, Miller had his first confirmed credit in writer Wyatt Gwyon's six-page "Deliver Me From D-Day", inked by Danny Bulanadi, in Weird War Tales #64 (June 1978). Former Marvel editor-in-chief Jim Shooter recalled Miller going to DC Comics after having broken in with "...a small job from Western Publishing, I think. Thus emboldened, he went to DC, and after getting savaged by Joe Orlando, got in to see art director Vinnie Colletta, who recognized talent and arranged for him to get a one-page war-comic job". The Grand Comics Database does not list this job; there may have been a one-page DC story, or Shooter may have misremembered the page count or have been referring to the two-page story, by writer Roger McKenzie, "Slowly, painfully, you dig your way from the cold, choking debris..." in Weird War Tales #68 (Oct. 1978). Other fledgling work at DC included the six-page "The Greatest Story Never Told", by writer Paul Kupperberg, in that same issue, and the five-page "The Edge of History", written by Elliot S. Maggin, in Unknown Soldier #219 (Sept. 1978). His first work for Marvel Comics was penciling the 17-page story "The Master Assassin of Mars, Part 3" in John Carter, Warlord of Mars #18 (Nov. 1978). Daredevil #158 (May 1979), Miller's debut on that title, was the finale of an ongoing story written by Roger McKenzie and inked by Klaus Janson. After this issue, Miller became one of Marvel's rising stars. However, sales on Daredevil did not improve, Marvel's management continued to discuss cancellation, and Miller himself almost quit the series, as he disliked McKenzie's scripts. Miller's fortunes changed with the arrival of Denny O'Neil as editor. Realizing Miller's unhappiness with the series, and impressed by a backup story he had written, O'Neil moved McKenzie to another project so that Miller could try writing the series himself. Miller and O'Neil would maintain a friendly working relationship throughout his run on the series. With issue #168 (Jan. 1981), Miller took over full duties as writer and penciller. Sales rose so swiftly that Marvel once again began publishing Daredevil monthly rather than bimonthly just three issues after Miller became its writer. Issue #168 saw the first full appearance of the ninja mercenary Elektra—who would become a popular character and star in a 2005 motion picture—although her first cover appearance was four months earlier on Miller's cover of The Comics Journal #58. Miller later wrote and drew a solo Elektra story in Bizarre Adventures #28 (Oct. 1981). He added a martial arts aspect to Daredevil's fighting skills, and introduced previously unseen characters who had played a major part in the character's youth: Stick, leader of the ninja clan the Chaste, who had been Murdock's sensei after he was blinded and a rival clan called the Hand. Daredevil #168 (Jan. 1981), Elektra's debut. Cover art by Miller and Klaus Janson. Unable to handle both writing and penciling Daredevil on the new monthly schedule, Miller began increasingly relying on Janson for the artwork, sending him looser and looser pencils beginning with #173. By issue #185, Miller had virtually relinquished his role as Daredevil's artist, and was providing only rough layouts for Janson to both pencil and ink, allowing him to focus on the writing. Miller's work on Daredevil was characterized by darker themes and stories. This peaked when in #181 (April 1982) he had the assassin Bullseye kill Elektra, and Daredevil subsequently attempt to kill him. Miller finished his Daredevil run with issue #191 (Feb. 1983), which he cited in a winter 1983 interview as the issue he is most proud of; by this time he had transformed a second-tier character into one of Marvel's most popular. Additionally, Miller drew a short Batman Christmas story, "Wanted: Santa Claus – Dead or Alive", written by Dennis O'Neil for DC Special Series #21 (Spring 1980). This was his first professional experience with a character with which, like Daredevil, he would become closely associated. At Marvel, O'Neil and Miller collaborated on two issues of The Amazing Spider-Man Annual. The 1980 Annual featured a team-up with Doctor Strange while the 1981 Annual showcased a meeting with the Punisher. As penciler and co-plotter, Miller, together with writer Chris Claremont, produced the miniseries Wolverine #1–4 (Sept.-Dec. 1982), inked by Josef Rubinstein and spinning off from the popular X-Men title. Miller used this miniseries to expand on Wolverine's character. The series was a critical success and further cemented Miller's place as an industry star. His first creator-owned title was DC Comics' six-issue miniseries Ronin (1983–1984). In 1985, DC Comics named Miller as one of the honorees in the company's 50th-anniversary publication Fifty Who Made DC Great. Miller was involved in a few unpublished projects in the early 1980s. A house advertisement for Doctor Strange appeared in Marvel Comics cover-dated February 1981. It stated "Watch for the new adventures of Earth's Sorcerer Supreme – - as mystically conjured by Roger Stern and Frank Miller!". Miller's only contribution to the series would be the cover for Doctor Strange #46 (April 1981). Other commitments prevented him from working on the series. Miller and Steve Gerber made a proposal to revamp DC's three biggest characters: Superman, Batman, and Wonder Woman, under a line called "Metropolis" and comics titled "Man of Steel" or "The Man of Steel", "Dark Knight" and "Amazon". However, this proposal was not accepted. In 1986, DC Comics released the writer-penciler Miller's Batman: The Dark Knight Returns, a four-issue miniseries printed in what the publisher called "prestige format"—squarebound, rather than stapled; on heavy-stock paper rather than newsprint, and with cardstock rather than glossy-paper covers. It was inked by Klaus Janson and colored by Lynn Varley. The story tells how Batman retired after the death of the second Robin (Jason Todd), and at age 55 returns to fight crime in a dark and violent future. Miller created a tough, gritty Batman, referring to him as "The Dark Knight" based upon his being called the "Darknight Detective" in some 1970s portrayals, although the nickname "Dark Knight" for Batman dates back to 1940. Released the same year as Alan Moore's and Dave Gibbons' DC miniseries Watchmen, it showcased a new form of more adult-oriented storytelling to both comics fans and a crossover mainstream audience. The Dark Knight Returns influenced the comic-book industry by heralding a new wave of darker characters. The trade paperback collection proved to be a big seller for DC and remains in print 25 years after first being published. By this time, Miller had returned as the writer of Daredevil. Following his self-contained story "Badlands", penciled by John Buscema, in #219 (June 1985), he co-wrote #226 (Jan. 1986) with departing writer Dennis O'Neil. Then, with artist David Mazzucchelli, he crafted a seven-issue story arc that, like The Dark Knight Returns, similarly redefined and reinvigorated its main character. The storyline, "Daredevil: Born Again", in #227–233 (Feb.-Aug. 1986) chronicled the hero's Catholic background, and the destruction and rebirth of his real-life identity, Manhattan attorney Matt Murdock, at the hands of Daredevil's nemesis, the crime lord Wilson Fisk, also known as the Kingpin. 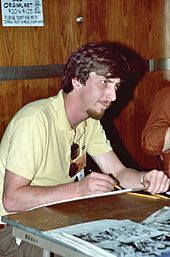 After completing the "Born Again" arc, Frank Miller intended to produce a two-part story with artist Walt Simonson but it was never completed and remains unpublished. Miller and artist Bill Sienkiewicz produced the graphic novel Daredevil: Love and War in 1986. Featuring the character of the Kingpin, it indirectly bridges Miller's first run on Daredevil and Born Again by explaining the change in the Kingpin's attitude toward Daredevil. 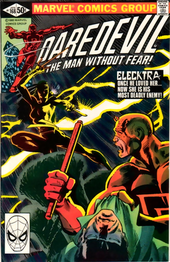 Miller and Sienkiewicz also produced the eight-issue miniseries Elektra: Assassin for Epic Comics. Set outside regular Marvel continuity, it featured a wild tale of cyborgs and ninjas, while expanding further on Elektra's background. This turned out to be inspiration for the film Teenage Mutant Ninja Turtles II: The Secret of the Ooze. Both of these projects were critically well received. Elektra: Assassin was praised for its bold storytelling, but neither it nor Daredevil: Love and War had the influence or reached as many readers as Dark Knight Returns or Born Again. Miller's final major story in this period was in Batman issues 404–407 in 1987, another collaboration with Mazzucchelli. Titled Batman: Year One, this was Miller's version of the origin of Batman in which he retconned many details and adapted the story to fit his Dark Knight continuity. Proving to be hugely popular, this was as influential as Miller's previous work and a trade paperback released in 1988 remains in print and is one of DC's best selling books and adapted as an original animated film video in 2011. Miller had also drawn the covers for the first twelve issues of First Comics English language reprints of Kazuo Koike and Goseki Kojima's Lone Wolf and Cub. This helped bring Japanese manga to a wider Western audience. After announcing he intended to release his work only via the independent publisher Dark Horse Comics, Miller completed one final project for Epic Comics, the mature-audience imprint of Marvel Comics. Elektra Lives Again was a fully painted graphic novel written and drawn by Miller and colored by longtime partner Lynn Varley. Telling the story of the resurrection of Elektra from the dead and Daredevil's quest to find her, as well as showing Miller's will to experiment with new story-telling techniques. 1990 saw Miller and artist Geof Darrow start work on Hard Boiled, a three-issue miniseries. The title, a mix of violence and satire, was praised for Darrow's highly detailed art and Miller's writing. At the same time Miller and artist Dave Gibbons produced Give Me Liberty, a four-issue miniseries for Dark Horse. Give Me Liberty was followed by sequel miniseries and specials expanding on the story of protagonist Martha Washington, an African-American woman in modern and near-future southern North America, all of which were written by Miller and drawn by Gibbons. Miller also wrote the scripts for the science fiction films RoboCop 2 and RoboCop 3, about a police cyborg. Neither was critically well received. In 2007, Miller stated that "There was a lot of interference in the writing process. It wasn't ideal. After working on the two Robocop movies, I really thought that was it for me in the business of film." Miller would come into contact with the fictional cyborg once more, writing the comic-book miniseries, RoboCop Versus The Terminator, with art by Walter Simonson. In 2003, Miller's screenplay for RoboCop 2 was adapted by Steven Grant for Avatar Press's Pulsaar imprint. Illustrated by Juan Jose Ryp, the series is called Frank Miller's RoboCop and contains plot elements that were divided between RoboCop 2 and RoboCop 3. In 1991, Miller started work on his first Sin City story. Serialized in Dark Horse Presents #51–62, it proved to be another success, and the story was released in a trade paperback. This first Sin City "yarn" was rereleased in 1995 under the name The Hard Goodbye. Sin City proved to be Miller's main project for much of the remainder of the decade, as Miller told more Sin City stories within this noir world of his creation, in the process helping to revitalize the crime comics genre. Sin City proved artistically auspicious for Miller and again brought his work to a wider audience without comics. Miller lived in Los Angeles, California in the 1990s, which influenced Sin City. Daredevil: The Man Without Fear was a five issue miniseries published by Marvel Comics in 1993. In this story, Miller and artist John Romita Jr. told Daredevil's origins differently from in the previous comics, and provided additional detail to his beginnings. Miller also returned to superheroes by writing issue #11 of Todd McFarlane's Spawn, as well as the Spawn/Batman crossover for Image Comics. In 1995, Miller and Darrow collaborated again on Big Guy and Rusty the Boy Robot, published as a two-part miniseries by Dark Horse Comics. In 1999 it became an animated series on Fox Kids. During this period, Miller became one of the founding members of the comic imprint Legend, under which many of his Sin City works were released, via Dark Horse. Written and illustrated by Frank Miller with painted colors by Varley, 300 was a 1998 comic-book miniseries, released as a hardcover collection in 1999, retelling the Battle of Thermopylae and the events leading up to it from the perspective of Leonidas of Sparta. 300 was particularly inspired by the 1962 film The 300 Spartans, a movie that Miller watched as a young boy. In 2007, 300 was adapted by director Zack Snyder into a successful film. He was one of the artists on the Superman and Batman: World's Funnest one-shot written by Evan Dorkin published in 2000. Miller moved back to Hell's Kitchen by 2001 and was creating Batman: The Dark Knight Strikes Again as the 9/11 terrorist attacks occurred about four miles from that neighborhood. His differences with DC Comics put aside, he saw the sequel initially released as a three-issue miniseries, and though it sold well, it received a mixed to negative reception. Miller also returned to writing Batman in 2005, taking on the writing duties of All Star Batman & Robin, the Boy Wonder, a series set inside of what Miller describes as the "Dark Knight Universe," and drawn by Jim Lee. Miller's previous attitude towards movie adaptations was to change after Robert Rodriguez made a short film based on a story from Miller's Sin City entitled "The Customer is Always Right". Miller was pleased with the result, leading to him and Rodriguez directing a full-length film, Sin City using Miller's original comics panels as storyboards. The film was released in the U.S. on April 1, 2005. The film's success brought renewed attention to Miller's Sin City projects. Similarly, a film adaptation of 300, directed solely by Zack Snyder, brought new attention and controversy to Miller's original comic book work. A sequel to the film, Sin City: A Dame to Kill For, based on Miller's second Sin City series and co-directed by Miller and Robert Rodriguez, was released in theaters on August 22, 2014. In 2015–2017, DC released a nine-issue, bimonthly sequel to The Dark Knight Returns and The Dark Knight Strikes Again, titled The Dark Knight III: The Master Race. Miller co-wrote it with Brian Azzarello, and Andy Kubert and Klaus Janson are the artists. It was the top-selling comic of November 2015, moving an estimated 440,234 copies. On July 10, 2015, at the San Diego Comic-Con, Miller was inducted into the Eisner Awards Hall of Fame. As of 2017, Miller is working with John Romita Jr. on a Superman: Year One project. Simon & Schuster Children's Publishing is scheduled to publish his and author Tom Wheeler's young-adult novel Cursed, about the King Arthur legend from the point of view of the Lady of the Lake, in late 2019. Netflix in 2018 ordered a 10-episode series based on the book. From April to August 2018, Dark Horse Comics published monthly Miller's 5-issue limited series prequel/sequel to 300, entitled Xerxes: The Fall of the House of Darius and the Rise of Alexander. The series marks Miller's return to full writer-artist comics creation since Holy Terror. In October 2012, Joanna Gallardo-Mills, who began working for Miller as an executive coordinator in November 2008, filed suit against Miller in Manhattan for discrimination and "mental anguish", stating that Miller's former girlfriend, Kimberly Cox, created a hostile work environment for Gallardo-Mills in Miller and Cox's Hell's Kitchen living and work space. In July 2011 at the San Diego Comic-Con International while promoting his upcoming graphic novel Holy Terror in which the protagonist hero fights Al-Qaeda terrorists, Miller made a remark about Islamic terrorism and Islam saying, "I was raised Catholic and I could tell you a lot about the Spanish Inquisition but the mysteries of the Catholic Church elude me. And I could tell you a lot about Al-Qaeda, but the mysteries of Islam elude me too." In November 2011, Miller posted remarks pertaining to the Occupy Wall Street movement in his blog, calling it "nothing but a pack of louts, thieves, and rapists, fed by Woodstock-era nostalgia and putrid false righteousness." He said of the movement, "Wake up, pond scum. America is at war against a ruthless enemy. Maybe, between bouts of self-pity and all the other tasty tidbits of narcissism you’ve been served up in your sheltered, comfy little worlds, you’ve heard terms like al-Qaeda and Islamicism." Miller's statement generated controversy. In a 2018 interview, Miller backed away from his comments saying that he "wasn't thinking clearly" when he made them and alluded to a very dark time in his life during which they were made. Until their divorce in 2005, Miller was married to colorist Lynn Varley, who colored many of his most acclaimed works (from Ronin in 1984 through 300 in 1998), and the backgrounds to the 2007 movie 300. Miller has since been romantically linked to New York-based Shakespearean scholar Kimberly Halliburton Cox, who had a cameo in The Spirit (2008). Daredevil's New York, under Frank's run, became darker and more dangerous than the Spider-Man New York he’d seemingly lived in before. New York City itself, particularly Daredevil's Hell's Kitchen neighborhood, became as much a character as the shadowy crimefighter; the stories often took place on the rooftop level, with water towers, pipes and chimneys jutting out to create a skyline reminiscent of German Expressionism's dramatic edges and shadows. Ronin shows some of the strongest influences of manga and bande dessinée on Miller's style, both in the artwork and narrative style. Sin City was drawn in black and white to emphasize its film noir origins. Miller has said he opposes naturalism in comic art: "People are attempting to bring a superficial reality to superheroes which is rather stupid. They work best as the flamboyant fantasies they are. I mean, these are characters that are broad and big. I don't need to see sweat patches under Superman's arms. I want to see him fly." Daredevil: Born Again and The Dark Knight Returns were both critical successes and influential on subsequent generations of creators to the point of being considered classics of the medium. Batman: Year One was also met with praise for its gritty style, while comics including Ronin, 300 and Sin City were also successful, cementing Miller's place as a legend of comic books. However, later material such as Batman: The Dark Knight Strikes Again received mixed reviews. In particular, All Star Batman and Robin the Boy Wonder was widely considered a sign of Miller's creative decline. Miller's graphic novel Holy Terror was accused of being anti-Islamic. Fellow comic book writer Alan Moore has described Miller's work from Sin City-onward as homophobic and misogynistic, despite praising his early Batman and Daredevil material. Moore previously penned a flattering introduction to an early collected edition of The Dark Knight Returns, and the two have remained friends. Miller would later say that he regrets Holy Terror, saying, "I don’t want to wipe out chapters of my own biography. But I'm not capable of that book again." In terms of Miller's film career, his 2008 adaptation of The Spirit received negative reviews, earning a metascore of 30/100 at Metacritic.com. Meanwhile, his film adaptation of Sin City was well received by audiences and critics. RoboCop 2—Miller's original script was heavily edited through rewrites as it was deemed unfilmable. The original script was adapted in 2003 by Steven Grant into the comics series, Frank Miller's RoboCop. RoboCop 3—Miller co-wrote this with the film's director Fred Dekker. The original script was adapted in 2013–2014 by Steven Grant into the comics series, RoboCop: Last Stand. Sin City—Miller made his directorial debut in this 2005 adaptation of his Sin City yarns, co-directing with Robert Rodriguez. 300—Miller was a producer for the film, which adapted the original comics series, shot-for-shot, into a feature film in 2006. The Spirit—Although Miller co-directed Sin City, this 2008 film was his first solo directing project. Batman: Year One—This was co-written and was due to be directed by Darren Aronofsky until Warner Bros. cancelled the project opting for Christopher Nolan's Batman Begins. It was finally adapted into an animated film, produced by Bruce Timm, resulting in a direct-to-home-media released in October, 2011. Batman: The Dark Knight Returns—A two-part direct-to-DVD animated film based on The Dark Knight Returns was released in 2012 and 2013 respectively. Sin City: A Dame to Kill For—In 2005, after Sin City was released, Robert Rodriguez announced plans for a follow-up film that would feature many of the same characters. He planned for the film to be based on A Dame to Kill For. Miller said the film would be a prequel and a sequel with interlinking stories both before and after the first film. Miller, who was writing the screenplay in 2006, had anticipated for production to begin later in the year. The film, co-directed by Miller and Rodriguez, was released in August 2014. The film version of Daredevil (2003) predominantly used the tone established and stories written by Miller, who had no direct creative input on the film (except for a cameo appearance). In Elektra (2005), Miller received credit for "comic book characters". The Wolverine (2013) was inspired by the 1982 Wolverine miniseries that Miller penciled with writer Chris Claremont. Frank Miller has appeared in six films in small, cameo roles, dying in each. In RoboCop 2 (1990), he plays "Frank, the chemist" and dies in an explosion in an illegal drug lab. In Jugular Wine: A Vampire Odyssey (1994), he is killed by vampires in front of Marvel Comics' Stan Lee. In Daredevil (2003), he appears as a corpse with a pen in his head, thrown by Bullseye, who steals his motorcycle. The credits list Frank Miller as "Man with Pen in Head". In Sin City (2005), he plays the priest killed by Marv in the confessional. In The Spirit (2008), which was written and directed by Miller, he appears as "Liebowitz", the officer whose head is ripped off by the Octopus and thrown at the Spirit. The name alludes to Jack Liebowitz, a co-founder of what would become DC Comics. In Sin City: A Dame to Kill For (2014), which Miller wrote and co-directed, he appears as "Sam", a man just shot by another character, played by Miller's co-director Robert Rodriguez, also in a cameo. ^ "Comics Industry Birthdays". Comics Buyer's Guide. Iola, Wisconsin (1650): 107. February 2009. ^ Dunning, John (n.d.). "Frank Miller: Comic Yo Kill For". Dazed. Archived from the original on May 10, 2016. ^ a b Webster, Andy (July 20, 2008). "Artist-Director Seeks the Spirit of The Spirit". The New York Times. Archived from the original on December 11, 2008. ^ a b Lovece, Frank (December 22, 2008). "Spirit guide: Frank Miller adapts Will Eisner's cult comic". Film Journal International. Archived from the original on April 5, 2013. ^ Applebaum, Stephen (December 22, 2008). "Frank Miller interview: It's no sin". The Scotsman. Edinburgh, Scotland. Archived from the original on October 15, 2012. Retrieved May 26, 2010. ^ The Cat #3 at the Grand Comics Database. ^ Miller, Frank (July 21, 2010). "Neal Adams". FrankMillerInk.com (official site). Archived from the original on August 3, 2010. Retrieved March 14, 2014. ^ "Royal Feast", The Twilight Zone #84 (June 1978) at the Grand Comics Database. ^ "Endless Cloud", The Twilight Zone #85 (July 1978) at the Grand Comics Database. ^ a b c Mithra, Kuljit (July 1998). "Interview with Jim Shooter". ManWithoutFear.com. Archived from the original on November 18, 2010. ^ Frank Miller at the Grand Comics Database. NOTE: A different artist named Frank Miller was active in the 1940s. He died December 3, 1949. ^ Saffel, Steve (2007). "A Not-So-Spectacular Experiment". Spider-Man the Icon: The Life and Times of a Pop Culture Phenomenon. London, United Kingdom: Titan Books. p. 73. ISBN 978-1-84576-324-4. Frank Miller was the guest penciler for The Spectacular Spider-Man #27, February 1979, written by Bill Mantlo. [The issue's] splash page was the first time Miller's [rendition of] Daredevil appeared in a Marvel story. ^ a b "Daredevil by Frank Miller & Klaus Janson, Vol. 1". Goodreads. n.d. Archived from the original on April 12, 2016. ^ Mithra, Kuljit (February 1998). "Interview with Dennis O'Neil". ManWithoutFear.com. Archived from the original on March 21, 2013. Retrieved May 10, 2013. ^ a b c Kraft, David Anthony; Salicup, Jim (April 1983). "Frank Miller's Ronin". Comics Interview (2). Fictioneer Books. pp. 7–21. ^ DeFalco, Tom "1980s" in Gilbert (2008), p. 201: "Matt Murdock's college sweetheart first appeared in this issue [#168] by writer/artist Frank Miller." ^ DeFalco "1980s" in Gilbert (2008), p. 202: "Possibly modeled after Nantembo, a Zen master who reputedly disciplined his students by striking them with his nantin staff, Stick first appeared in this issue [#176] by Frank Miller." ^ DeFalco "1980s" in Gilbert (2008), p. 202: The Hand was a league of ninja assassins who employed dark magic...Introduced in Daredevil #174 by writer/artist Frank Miller, this group of deadly warriors had been hired by the Kingpin of Crime to exterminate Matt Murdock." ^ a b Cordier, Philippe (April 2007). "Seeing Red: Dissecting Daredevil's Defining Years". Back Issue!. Raleigh, North Carolina: TwoMorrows Publishing (21): 33–60. ^ DeFalco "1980s" in Gilbert (2008), p. 207: "Frank Miller did the unthinkable when he killed off the popular Elektra in Daredevil #181." ^ Manning "1980s" in Gilbert (2012), p. 120: "Writer Denny O'Neil teamed with artist Frank Miller to concoct a Spider-Man annual that played to both their strengths. Miller and O'Neil seemed to flourish in the gritty world of street crime so tackling a Spider/Punisher fight was a natural choice." ^ Goldstein, Hilary (May 19, 2006). "Wolverine TPB Review He's the best at what he does and so is Frank Miller". IGN. Archived from the original on April 11, 2013. Retrieved November 25, 2011. ^ Cronin, Brian (April 12, 2007). "Comic Book Urban Legends Revealed #98". Comic Book Resources. Archived from the original on July 5, 2013. Retrieved December 18, 2010. ^ Cronin, Brian (April 1, 2010). "Comic Book Legends Revealed #254". Comic Book Resources. Archived from the original on November 13, 2011. Retrieved November 6, 2011. ^ Jameson, A. D. (February 8, 2010). "Reading Frank Miller's Batman: The Dark Knight Returns, part 2". Big Other. Retrieved September 27, 2018. ^ Fleisher, Michael (1976). The Encyclopedia of Comic Book Heroes Volume 1 Batman. New York, New York: Collier Books. p. 31. ISBN 978-0-02-080090-3. ^ Nobleman, Marc Tyler (2012). Bill the Boy Wonder: The Secret Co-Creator of Batman. Charlesbridge Publishing. p. Back Matter. ISBN 978-1-58089-289-6. ^ The term appears on page seven of the story "The Joker" from Batman No. 1 (1940), which is reprinted in the book Batman Chronicles, Volume One (2005). In the lower right panel, Batman is shown swimming in the water after having been knocked off a bridge by the Joker, and the caption reads "THE SHOCK OF COLD WATER QUICKLY REVIVES THE DARK KNIGHT!" ^ DeFalco "1980s" in Gilbert (2008), p. 226: "'Born Again' was a seven-issue story arc that appeared in Daredevil from issue #227 to #233 (Feb.–Aug. 1986) by writer Frank Miller and artist David Mazzucchelli." ^ Mithra, Kuljit (1997). "Interview With Walt Simonson". ManWithoutFear.com. Archived from the original on March 17, 2013. Retrieved March 17, 2013. The gist of it is that by the time Marvel was interested in having us work on the story, Frank was off doing Dark Knight and I was off doing X-Factor. So it never happened. Too bad—it was a cool story too. ^ DeFalco "1980s" in Gilbert (2008), p. 228: "Produced by Frank Miller and illustrated by Bill Sienkiewicz, Elektra: Assassin was an eight-issue limited series. Because its mature content was inappropriate for children, it was published by Marvel's Epic Comics imprint." ^ Manning "1980s" in Dolan, p. 227 "Melding Miller's noir sensibilities, realistic characterization, and gritty action with Mazzucchelli's brilliant iconic imagery, "Year One" thrilled readers and critics alike...as well as being one of the influences for the 2005 film Batman Begins. ^ a b Flinn, Tom. "Writer's Spotlight: Frank Miller: Comics' Noir Auteur," ICv2: Guide to Graphic Novels #40 (Q1 2007). ^ Manning, Matthew K. "1990s" in Gilbert (2008), p. 253: "Frank Miller made his triumphant return to Elektra, the character he breathed life into and then subsequently snuffed out, with the graphic novel Elektra Lives Again." ^ Irving, Christopher (December 1, 2010). "Frank Miller Part 1: Dames, Dark Knights, Devils, and Heroes". NYCGraphicNovelists.com. Archived from the original on July 1, 2012. Retrieved November 25, 2011. Miller works Matt’s narrating captions between the present, the past, and his dream imagery of Elektra, a fragmentation given a voiceover straight out of an old crime book, but with a heavy dose of sensitivity that never veers into the maudlin. ^ Burgas, Greg (September 17, 2008). "Comics You Should Own – Hard Boiled". Comic Book Resources. Archived from the original on October 18, 2012. Retrieved November 25, 2011. [W]e can see that Miller and Darrow were creating a marvelous satire, one that pulls no punches and lets none of us off the hook, which is what the best satire does. Hard Boiled is a wild and extremely fun ride, but it’s also an insightful examination of a sickness in our society that we don’t like to confront. ^ Maslin, Janet (June 22, 1990). "Robocop 2 (1990) Review/Film; New Challenge and Enemy For a Cybernetic Organism". The New York Times. Retrieved November 25, 2011. ^ Ebert, Roger (November 5, 1993). "RoboCop 3". Chicago Sun-Times. Retrieved November 25, 2011. ^ "Miller: 'Robocop Movies Almost Put Me Off Hollywood'". Contactmusic.com. June 20, 2007. Retrieved November 25, 2011. ^ Lindenmuth, Brian (December 14, 2010). "The Fall (and Rise) of the Crime Comic". Mulholland Books. Retrieved November 13, 2011. As much as 100 Bullets is a cornerstone of the modern crime comic, it did not spring fully formed into the world. The modern crime comic era started a few years earlier with two releases: the high-profile Sin City by Frank Miller and the independent Stray Bullets by David Lapham. ^ Manning "1990s" in Gilbert (2008), p. 264: "Comic legends Frank Miller and John Romita, Jr. united to tell a new version of Daredevil's origin in this carefully crafted five-issue miniseries." ^ Manning "1990s" in Dolan, p. 267: "This prestige one-shot marked Frank Miller's return to Batman, and was labeled as a companion piece to his classic 1986 work Batman: The Dark Knight Returns. The issue was drawn by Todd McFarlane, one of the most popular artists in comic book history." ^ Green, Karen (December 3, 2010). "Into the Valley of Death?". ComiXology. Archived from the original on October 20, 2011. Retrieved November 25, 2011. It's like something out of Hollywood, right? Hollywood thought so, too. They made a movie in 1962 called The 300 Spartans, which 5-year-old Frank Miller saw in the theater, and it had a powerful influence on him. ^ Yarbrough, Beau (March 18, 1999). "Evan Dorkin Debuts World's Funnest". Comic Book Resources. Archived from the original on September 5, 2015. ^ Manning "2000s" in Dougall, p. 258: "With this three-issue prestige format story, writer/artist Miller once again set the scene for a large scale Batman adventure." ^ "Top 300 Comics–December 2001". ICv2. November 28, 2001. Archived from the original on September 13, 2016. "Top 300 Comics–January 2002". ICv2. January 2, 2002. Archived from the original on September 13, 2016. "Top 300 Comics–February 2002". ICv2. February 4, 2002. Archived from the original on September 13, 2016. ^ Lalumière, Claude (September 21, 2002). "The Dark Knight Strikes Again". Archived from the original on June 16, 2016. Retrieved August 30, 2012. ^ Sabin, Roger (December 15, 2002). "Take a picture..." Archived from the original on March 29, 2016. Retrieved August 30, 2012. ^ Manning "2000s" in Dougall, p. 282: "Together with penciller Jim Lee, Miller delivered a series that took place in a reality that began with Miller and David Mazzucchelli's 'Batman: Year One'." ^ Adler, Shawn (May 26, 2007). "Depp, Banderas To Call 'Sin City' Home?". MTV News. ^ McMillan, Graeme (July 11, 2015). "Comic-Con: Will Eisner Comic Industry Award Winners Announced". The Hollywood Reporter. Archived from the original on August 28, 2015. ^ Johnston, Rich (July 20, 2018). "Sneak Peek Inside DC Black Label's Batman: Damned and Superman: Year One". Bleeding Cool. Archived from the original on August 20, 2018. Retrieved August 21, 2018. ^ Canfield, David (March 22, 2018). "Frank Miller to spin King Arthur legend into YA book Cursed". EW. ^ Andreeva, Nellie (March 28, 2018). "Netflix Orders TV Series 'Cursed' From Frank Miller & Tom Wheeler Based On Book Reimagining King Arthur Legend". Deadline. ^ Schram, Jamie (October 10, 2012). "Ex-staffer sues Dark Knight comic creator, girlfriend for hostile work environment", Daily News; accessed January 17, 2018. ^ Daniels, Hunter (July 23, 2011). "Comic-Con 2011: Frank Miller on Holy Terror: 'I Hope This Book Really Pisses People Off'". Collider. Complex Media. Retrieved April 8, 2013. ^ Mann, Ted. "Frank Miller Doesn't Think Much of Occupy Wall Street". ^ "The Honest Alan Moore Interview". 2011. Retrieved April 26, 2013. [The Occupy movement] is a completely justified howl of moral outrage and it seems to be handled in a very intelligent, non-violent way, which is probably another reason why Frank Miller would be less than pleased with it. I'm sure if it had been a bunch of young, sociopathic vigilantes with Batman make-up on their faces, he'd be more in favour of it. ^ a b Thielman, Sam (April 27, 2018). "Frank Miller: 'I wasn't thinking clearly when I said those things'". The Guardian. Archived from the original on July 11, 2018. ^ Manning "1980s" in Dolan, p. 202: The comic was an unusual blend of the influences on Miller by French cartoonist Moebius and Japanese Manga comic books. ^ Hillhouse, Jason (writer) (2005). Legends of the Dark Knight: The History of Batman. New Wave Entertainment. Archived from the original (DVD) on October 31, 2014. Retrieved October 9, 2013. ^ Gatevackes, William (February 10, 2006). "All-Star Batman & Robin #1–3". PopMatters.com. Archived from the original on January 18, 2010. Retrieved December 20, 2012. ^ Robinson, Iann (December 17, 2007). "Review". Crave Online. Archived from the original on January 18, 2010. Retrieved 20 December 2012. ^ Hernandez, Michael (October 25, 2011). "Holy Terror comic is 'Islamophobic', say critics". The National. Archived from the original on January 14, 2013. Retrieved November 25, 2011. Miller's mixing of Muslims and Arabs – the book never differentiates – with terrorists highlights Holy Terror's unflattering portrayal of Muslims. ^ Flood, Alison (December 6, 2011). "Alan Moore attacks Frank Miller in comic book war of words". The Guardian. London. Retrieved December 20, 2012. ^ "Frank Miller parla di Alan Moore e di Batman V Superman". YouTube. September 15, 2014. ^ "The Spirit". Metacritic.com. Retrieved December 20, 2012. ^ "Sin City Reviews". Metacritic. Retrieved September 19, 2013. ^ Briggs, Caroline (May 19, 2005). "Sin City writer defends violence". BBC. ^ "Sin City Sequel in the Works". IGN. May 23, 2005. Retrieved March 4, 2011. ^ Vineyard, Jennifer (March 29, 2006). "Sin City Characters – Even Dead Ones – Returning For Sequel". MTV. Retrieved March 4, 2011. ^ Lindenmuth, Kevin J. (1998). Making Movies On Your Own: Practical Talk From Independent Filmmakers. McFarland & Company. p. 114. ISBN 0-7864-0517-1. Retrieved November 25, 2011. ^ "Frank Miller". Avatar Press. Retrieved November 26, 2011. Miller's filmography also includes...a handful of film cameos including an appearance in the 2003 film Daredevil. ^ "Frank Miller's Sin City" TV Guide.com. Retrieved August 21, 2011. ^ "The Annotated Spirit: A Guide to the Movie's In-joke References". Filmjournal.com. December 22, 2008. Retrieved November 8, 2010. ^ Hawks, Asa (August 23, 2014). "Robert Rodriguez on Sin City 3, his mini movie with Frank Miller in Sin City 2 and why Clive Owen was not in A Dame To Kill For". starcasm.net. Chicory Media LLC. Retrieved December 13, 2014. Wikimedia Commons has media related to Frank Miller. This page was last edited on 21 April 2019, at 20:53 (UTC).